This chrome motorcycle license plate frame includes six white full-spectrum HID type LED bulbs on a 6-inch strip for brighter illumination of your license plate. 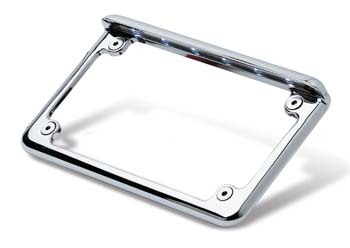 The LED motorcycle license plate frame is made with a sturdy cast aluminum and plated in chrome or powder coated in black finish that won't easily come off or get scratched. Heavy and nice finish came with all hardware. This is my 4th Lic/Plt frame. Always Excellent fit & finish, Craftsmanship, & function. It's a really neat license plate frame! It fits pretty well. The light is really bright and looks great! Looks great on my Harley!